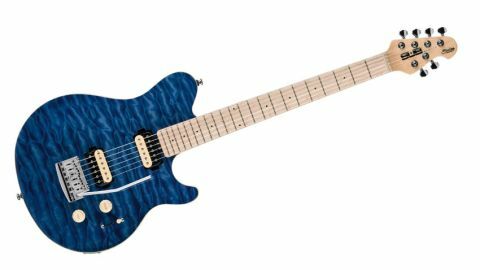 The AX3 is a joy to play, and we'd heartily recommend it for a beginner who wants to hone their chops on an quality value axe with an 80s vibe. Great coil-split tones. Asymmetrical neck is great. Vibrato system doesn't destroy the tuning. Keen scholars of 80s rock might find that this guitar looks a bit familiar. The SUB AX3 is descended from spandex royalty, since it's based on the Music Man Axis' the former signature guitar for none other than Eddie Van Halen. Eddie may have since taken his M&Ms and flounced off to do his own thing these days, but the Axis remains a classic design that's well worthy of your attention. And thanks to Sterling by Music Man's thrifty SUB series, almost any guitarist can afford a slice of the action. Music Man's familiar tiny headstock, which has four machineheads on one side and two on the other, may look like a gimmick to some, but in the flesh it makes perfect sense. The arrangement of the tuners ensures a straight string break over the nut, and the shorter headstock means that there's no need for string trees. There's nothing for the strings to get stuck on, so you can bend, shake and wobble the vibrato like a loony without fear of going out of tune. "The most impressive feature is the neck. It's an asymmetric carve, meaning that it's thicker on the bass side than the treble." The most impressive feature is the neck. It's an asymmetric carve, meaning that it's thicker on the bass side than the treble. This gives you plenty of meat to wrap your mitts around when you're playing chords and chunky riffs, but there's no excess thickness to get in the way of your technique when you're busy melting faces on the solo side of the fretboard. Thanks to a coil-split function built into the pickup selector switch, the AX3 offers two humbucker sounds, neck and bridge coil-split single coils and the two single coils together in the middle position. "In single-coil mode, you get a cutting tone that lends itself to percussive, funky styles, such as the cleaner parts of John Frusciante's Chilis work"
The odd thing here is that the single-coil sounds, which can sound a bit flat on some coil-tapped humbuckers, are the stars of the show, while the full humbuckers are a little lacking. In single-coil mode, you get a cutting tone that lends itself to percussive, funky styles, such as the cleaner parts of John Frusciante's Chilis work. In the middle position, the two single coils give a hollowed-out chicken-pickin' sound that's in prime country territory. But the humbuckers on their own don't measure up - there's a boost in volume and midrange, but they don't set our world on fire. That's a shame, because it's the only serious black mark to spoil an otherwise great guitar. That quilted maple finish isn't real, either - it couldn't be at this price - but it looks pretty cool from a distance. Up close there are a few rough ends but, crucially, not on the neck, frets or bridge.